In my last post I remarked at the disgust I felt towards a woman who is so emotionally overwhelmed that the concept of critical and rational logical thought is completely anathema to her and her psychological type. Q has labelled these people as “emotionally vulnerable”, and as a group they are certainly identifiable via their Myer’s-Briggs Personality Type – they would be the types most unlike the rationalist INTJ, for example. Now while we might like to lay blame of the world’s problems on these people, the point which Q made that they are “emotionally vulnerable” is an extremely important one. In the context of Ontological Mathematics and all of our soul’s journey to becoming rationally enlightened, it is obvious that not all souls incarnated have the same level of developed rational faculty. That’s a remarkable statement for an emotionally-directed person to make, is it not!? It’s incredible. What does it demonstrate? It demonstrates that these type of people are entirely brainwashed by the mainstream media narrative. It demonstrates that if they knew the truth, that they would probably have an entirely different outlook. Her, and others like her, narrative is entirely created and entirely manufactured by the mainstream media. There is nothing factual that Trump has ever said or done that can quantifiably or qualitatively demonstrate that he is a racist. Nor the vast majority of his supporters. And while we may rightly criticize the people in the video’s duplicity in not caring so much if it is a Democrat who is clearly the provably racist by the Left’s current standards of such, while if it had’ve been Trump in those pictures there would have been riots and chaos in the streets and mass calls for resignation, we must remember that that is entirely within the modus operandi of an emotional type (to be rationally and yes even emotionally inconsistent), it is good again to note that these people’s mental cognitive space has been entirely crafted by the mainstream media who these people seem to implicitly trust and for whom are unable to examine actual source material or alternative Press sources. The point being that it is entirely the “Free Press”, i.e. the corporate conglomerate globalist ultra-predatory-capitalist controlled press, which is responsible for the degree of misinformation that these emotionally vulnerable people suffer under. The fact is that there is no responsibility in the Press to tell the truth, or to ask meaningful questions, or to do anything. The “Free Press” allows the Press to do and to pretend whatever they want, without consequence. The Free Press can simply pretend that Trump is racist, or whatever other scenario they want in any reference frame, and by such pretense then manufacture and sustain that very idea in the minds of the emotionally vulnerable with no evidence at all. Some emerging systems of thought have thus stated that Press must be held accountable to lying, as in a court of law. The Press must be punishable for lying or for feigning pretenses that create lies. And that seems reasonable, like it should work. However, we have this lesson from climate alarmism, that even with review from peers and so-called governing bodies and an entire apparatus designed supposedly for ensuring rational discourse, lies and simulacra can still enter and take everything over and become a sole-governor of what topics are allowed to be discussed, etc. And as we have seen, the Press begins to take entire control over what is allowed to be said and in what way it can be said, etc. Thus, has anyone considered simply not having any Press at all? What if these emotionally vulnerable people only had source material to reference? What if instead of relying on other people to tell you what to think, while you never make contact with actual source material at all, everyone and especially the emotionally vulnerable only ever had access to direct source material? Wouldn’t that result in one of the most radical transformations of collective human consciousness which has ever occurred? Why have a Press? What really is the need for it? Why do you want other people to tell you what to think, while they know that you will never go check the source and thus giving the opportunity for them to outright lie to you? Do you think that could work? Instead of papers and television and YouTube personalities telling you what to think, what if the only thing that the media was allowed to present to you was unedited transcripts and recordings of source material? We can have freedom of speech, entire freedom of speech, but NO Press. Not limited Press, but no Press at all. Only source material. These emotionally vulnerable people simply never hear Trump and the border control agents talking about human trafficking through the open border, and the horrific stories that the agents encounter, etc. Truly horrible, disgusting stuff that goes on with an open border. Emotionally, let alone rationally, sickening stuff. And so what if the emotionally vulnerable people finally got to listen to this stuff, without the superimposed and fake narrative that a border is “racist, misogynist, whatever-ist” etc. Well, emotionally vulnerable people would of course immediately become enraged and upset and horrified at the damage that an open border causes once they hear how innocent people are physically and mentally harmed by it, and of course they would immediately demand that something be done about it. All of this stuff about “racist” MAGA hats and “racist” borders is 100% manufactured lying narrative from the mainstream Press. Given that the existence of a Press will always allow for an open door to fakery and lies, as we have even seen with mainstream science adopting flat Earth theory in a most clandestine but emotionally compelling manner, what if we simply did away with Press and everyone only ever had access to source material to consider for themselves? Now what about people who, say, simply have a YouTube channel and want to talk about world events with their friends, and there are others who share the same opinions about such events anyway? Well I guess that would be fine…you just can’t have any organized, monetized, advertiser-supported, profit or charity oriented enterprise of a Press. And then, add a provision that any such group and/or individuals which still discusses things in a Press-like manner can be subject to fines for spreading misinformation when source material does not support false pretenses or actual claims. Or maybe it could be lightened up a little to have viewer-supported “Press personalities” only, and disallow any form of external paid-advertising, etc. Isn’t Fake News Media and constant advertisement through it two of the worst aspects of modern human life? They really are the worst. So why not just get rid of it? Allow people to talk to each other again, after they’ve watched or listened to what actually happened. Rather than people talking to each other after they’ve been misinformed and lied to while they never actually go check source material. So, freedom of speech for the individual, but not freedom of speech for advertiser-funded corporate predatory capitalist globalist “news” agencies. Well, what do you think? How do you solve the problem of lying Press which manipulates emotionally vulnerable people and which capitalizes upon their ability to be neither rationally or emotionally consistent? Wouldn’t emotionally vulnerable people be far, far less of a problem for the world if they weren’t allowed to be so openly and brazenly emotionally manipulated in the first place? It’s a big deal because it even goes as far as flat Earth theory finding it’s way into modern science among our so-called intellectuals. In my book I stated that we must hereonforth base everything upon the Principle of Sufficient Reason. Freedom of the press seems to enslave minds of emotionally vulnerable people. Is this a price of freedom that we should be willing to pay? No. Agreed! It serves no one, and harms everyone. We do not need to ban MSM. They are doing a good job undermining their own existent. They are slowly dying as we could see over the last week or so. Several hundreds of leftists “journalists” has been told to start lerning a new trade, remember – learn to code!? Freedom of speech does not mean freedom to fabricate falsehoods — it should mean freedom to speak truths or, at least, freedom to nurture intentions of speaking truths. Using emotionally charged language to create drama, and taking this to the point of telling lies to reach market share, to attract more advertisers, to pay salaries of news organizations, is not what freedom of speech entails. News organizations are pulling out all stops to create emotionalized reporting and entertainment. I’ve noticed the transitional sounds between stories in my local TV news, where there used to be smooth silence. Even the three-second pause between one story and the next on TV has to be filled with some swishing sound or tinkle, as if even three seconds of silence between one story and the next would be boring torture. The only issue is that source material can also be flooded into any forum where ordinary people can access it. We have seen this just as much with climate science already. There will always be gatekeepers. Besides, what is the origins of press anyway other than speech? I can stand in a town square and tell lies just the same as I can write down lies and mass print them at home to put in peoples’ letterboxes. The issue is and always will be, dumb people. The only fix for that is to abolish State education. It is that, after all, that breeds so many non rational people in the first place. That indoctrinates the young minds to do nothing other than accept what they are told. We can’t change the people simply by abolishing the press. The press only have power because by the time people come to consume the news they have already been conditioned to accept it without question. Well there is that maxim that: the solution to bad government is not no government but good government; the solution to bad education is not no education but good education; the solution to bad science is not no science but good science; and the solution to a bad Press is not no Press but a good Press. But we are still faced with the problem as given an example with climate alarm: that even with an ostensible intent to create good science, and even with an ostensible intent for science to examine itself and correct itself…the latter doesn’t actually happen because it easiest for it not to happen because it is easy to be complacent and to “trust the machine” as one colleague put it, and fake science can inveigle its way right to the top of otherwise useful science. And so what is the problem? As was just said – stupid people. Stupidity in its myriad forms. As I said in my book, we require constant and I’ll say here an almost paranoid vigilance, with basis in the Principle of Sufficient Reason. We need to try harder, we need to try with more intent and focus, and we must not be complacent and lazy. But certainly, we do need to figure out how to avoid stupid people from having so much influence, and we need to figure out how to STOP parasitical people from so easily and entirely manipulating the entire mass of stupid people. It’s just out in the open and clear now: they are openly admitting that they want the border open specifically for child trafficking. Sick disgusting goblins. If the emotionally manipulable were ever actually informed of what their supposed side of the political divide is doing…would they react? Or would their duplicity actually turn around and not care about such things since it’s their side doing it? On the one hand we may chalk it up to stupidity. On the other, if stupidity becomes accessory to such crimes by looking away as it suits itself, then it must be held as entirely complicit…100%. I am all for paranoid vigilance…lol. But seriously…you can’t make up this stuff…lol. It was from reading Larry Niven’s “Known Universe” collection, and the stories related to the ARM, where the whole utility of paranoid vigilance became instilled in me. It’s what you don’t know…or what you’ve missed or overlooked…that’s screwing you the worst. Hence the need for intuition, for the ability to extrapolate a threat vector from a single misplaced word or item, etc. Or…from no overt hint at all…lol. All a show though. Who’s actually in charge of creating that!? Well I didn’t say no education. I said no STATE education. Not no science, but no STATE science. It’s when powerful people take control of the State and use it to control areas that the State should have no business in, that people are made dependent on and thus unquestioning of, what the State says and does. State medicine. State welfare. State education. State science. State media. State jobs. The State is by definition, Collectivist, parasitical and expansionist. It is the “locus” as Mr anti Scorpion man in that video above might say (wow he did take a long time to say what could have been said in 5 minutes). Note on the media side that it is not State owned, but it is still State sanctioned and State regulated. How do you think CNN or Fox got control of the TV bandwidth, without first buying a Politician to secure it in laws and regulations that would shut out competition? Dependency breeds complacency. Complacency breeds stupidity. We need to tear down all of the things that make people dependent on the State. The most important of which is education of children. Surprisingly the “Media” have edited this interview to take out the Mr Barnes’s criticism of the “Media spinning the story” !! Here is a full transcript from youtube…. Destiny for some is to save lives…Destiny for some is to end lives …. I often wonder just how many people are “outraged” at such things. I doubt it is very many. Instead media claims there is outrage and seeks out those few who are prepared to play along. The majority of people simply rubbernecking the manufactured drama. The media wouldn’t have any power over people if people weren’t conditioned to be submissive when they were children, especially at school. The conditioning the media itself does, is simply an extension of a process that originated long before they got their own opportunity. Wow man yah…think of that…the preconditions already in place instituted in order to allow for rampant fake news. This video is getting around. Everyone who sees it has to show it to someone else and the responce is always the same: Mouth open, speechless. See level will rise 4%. (That<s big right ? No ! What's 4% of 1mm or whatever insignificant rise ? That's what you get from the MSM !!! People are stupid. They can't see through the fog !!! That's the problem. I hope people are realizing how stupid they’re being. “Khalid Sheikh Mohammed is a Pakistani Islamist militant held by the United States at the Guantanamo Bay detention camp under terrorism-related charges. He was named as “the principal architect of the 9/11 attacks” in the 9/11 Commission Report”. Evidently former President Bush Jr. met with President Trump and was granted the embarrassment of going through trial. He agreed to turn state’s evidence against the Deep State and his father, former President H.W. Bush, mainly on their 9/11 crimes. Former Presidents George Bush Jr., Barak Obama and Bill Clinton, plus Hillary Clinton and former VP Joe Biden were said handed indictments in envelops slipped into their programs at the Bush funeral on Nov. 31. Presently they were believed incarcerated in a special prison called Camp 7 at GITMO. The government had recently spent $69 million to build Camp 7 that was designed to hold 15 high value detainees. It was also reported from evidence leading up to the Military Tribunals at GITMO, that on Aug. 25 2018 Senator John McCain was executed for Treason and Child Trafficking, plus on Nov. 13 2018 former President George H.W. Bush was executed for violations of the Rico Act and Child Trafficking. Evidently Bush took part in the JFK assassination and designed the attempted assassination of President Ronald Reagan. On Jan. 28 GITMO Pretrials began on five defendants of the 9/11 crimes – trials that were subsequently delayed until March because of Military Court Judge Colonel Parrella’s medical problems. No mainstream media would be allowed to cover the Military Tribunals on political elites that were expected to last for around two years. It was well known that the US Press was controlled by George Soros-owned organizations. Soros himself had been arrested Feb. 3 and was believed presently under interrogation at a bunker near Gasternal, Switzerland. The evidence to arrest Soros was said to come from former President Barak Obama and other informants at GITMO. Obama was believed to have been incarcerated at GITMO for at least a month, exposing crimes of upper echelons of the Deep State to save his own execution. Obama was thought to have been charged with High Treason for multiple crimes including Uranium One, the Benghazi massacre and cover up by the FBI – the same crimes as Hillary Clinton was thought charged, along her husband and the Clinton Foundation for crimes in running criminal enterprises, obstruction of justice and money laundering. Multiple sources have confirmed that former Clinton Campaign chief Tony Podesta and his brother John were among 17 DC indictments. The Podesta brothers were said to be under investigation for child kidnapping, pedophilia and their involvement in selling the country’s Uranium to Russia. Among Soros’ suspected many other crimes were illegally influencing US elections (he was said to own the software for many state voting machines), organizing and funding illegal immigrants to force their way across the US border and was a reported leader of child trafficking and exploitation for the Ninth Circle Child Sacrifice Cult run out of the Vatican. Only certain reporters would be allowed into the tribunals. I was not one of them, but David Zublick, Leonard Bacani and Linda Forsythe were. After 9/11 on Sept. 14 2001 Congress passed the basis for Martial Law and Military Tribunals. An Executive Order for Military Tribunals signed by President Trump went into effect Jan. 1 and the pretrials started on Jan. 2. The tribunals were to be held in secret locations, at GITMO, various military bases and federal courts across the nation, (some were known to be going on right now in South Carolina). US Attorney John Huber and his 174 investigators had spent over two years investigating and filing over 71,000 indictments against political and global elites in federal courts. Attorney General Jeff Sessions, General James Mattis and General John Kelly were in charge of the Military Tribunals. Finally we have some in-depth reporting of the military tribunals going on at GITMO from citizen journalists Linda Forsythe and Leonard Bacani. They have also released PDF transcripts approved by the Department Of Defense (DOD) for release to the public. We The People are bypassing #FAKENEWS main stream media. Hopefully we will see higher echelon political names covered in these military tribunal reports and not low level minions. This may be a testing ground to see how the public reacts to alternative media reporting on the tribunals. It could also be a diversion while the big names are tried in secret, kind of like giving us breadcrumbs until GESARA is announced publicly. Interesting on how this plays out. See below for the video update from C-Vine News. Surprising information was revealed when Leonard Bacani and Linda Forsythe (who are both Citizen Journalists with the C-VINE International News Network) reported on the Military Tribunals Live Streamed CCTV out of GITMO to Ft. Meade In Maryland. This was Part 1 of 2 covering the first day on 1/28/2019. Critical To Watch! Part 2 of the GITMO Military Tribunal’s Are Revealing Games Are Underway to Take Away Our Constitutional Rights for Public Viewing by Trying to Set a Precedent of Closed Hearings Utilizing the Pre-Trial Hearings of Khalid Shaikh Mohammad et al. Leonard Bacani and Linda Forsythe as Citizen Journalists of C-VINE News were able to view and report on these proceedings LIVE Streamed at Fort Meade Base via CCTV from GITMO. 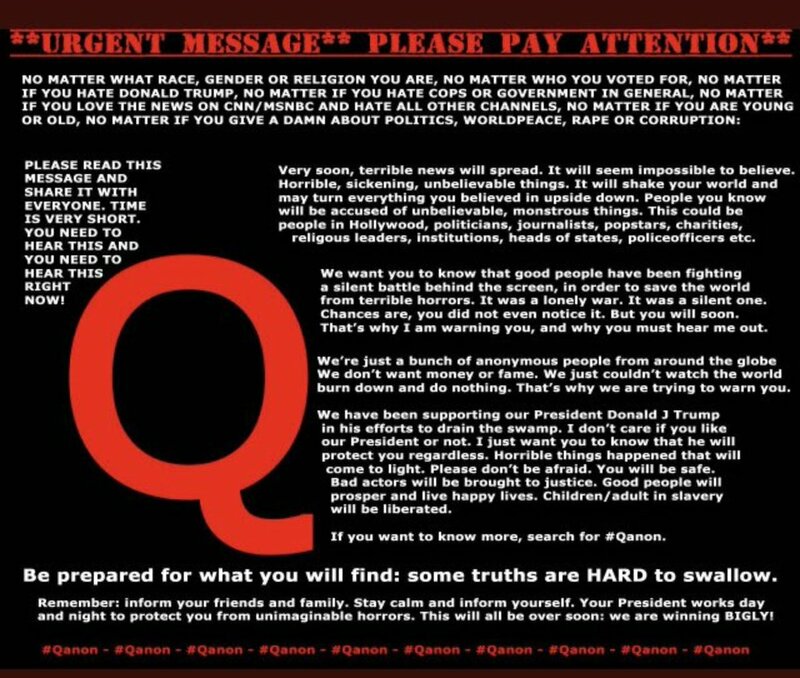 Qanon +++ (you know what it means) !! Can you feel the sophistry, do you know what or why?